The Nobel Prize in Chemistry (Swedish: Nobelpriset i kemi) is awarded annually by the Royal Swedish Academy of Sciences to scientists in the various fields of chemistry. It is one of the five Nobel Prizes established by the will of Alfred Nobel in 1895, awarded for outstanding contributions in chemistry, physics, literature, peace, and physiology or medicine. This award is administered by the Nobel Foundation, and awarded by Royal Swedish Academy of Sciences on proposal of the Nobel Committee for Chemistry which consists of five members elected by Academy. The award is presented in Stockholm at an annual ceremony on December 10, the anniversary of Nobel's death. The first Nobel Prize in Chemistry was awarded in 1901 to Jacobus Henricus van 't Hoff, of the Netherlands, "for his discovery of the laws of chemical dynamics and osmotic pressure in solutions." From 1901 to 2018, the award has been bestowed on a total of 180 individuals. Alfred Nobel stipulated in his last will and testament that his money be used to create a series of prizes for those who confer the "greatest benefit on mankind" in physics, chemistry, peace, physiology or medicine, and literature. Though Nobel wrote several wills during his lifetime, the last was written a little over a year before he died, and signed at the Swedish-Norwegian Club in Paris on 27 November 1895. Nobel bequeathed 94% of his total assets, 31 million Swedish kronor (US$198 million, €176 million in 2016), to establish and endow the five Nobel Prizes. Due to the level of skepticism surrounding the will, it was not until April 26, 1897 that it was approved by the Storting (Norwegian Parliament). The executors of his will were Ragnar Sohlman and Rudolf Lilljequist, who formed the Nobel Foundation to take care of Nobel's fortune and organise the prizes. The members of the Norwegian Nobel Committee that were to award the Peace Prize were appointed shortly after the will was approved. The prize-awarding organisations followed: the Karolinska Institutet on June 7, the Swedish Academy on June 9, and the Royal Swedish Academy of Sciences on June 11. The Nobel Foundation then reached an agreement on guidelines for how the Nobel Prize should be awarded. In 1900, the Nobel Foundation's newly created statutes were promulgated by King Oscar II. According to Nobel's will, The Royal Swedish Academy of Sciences were to award the Prize in Chemistry. The committee and institution serving as the selection board for the prize typically announce the names of the laureates in October. The prize is then awarded at formal ceremonies held annually on December 10, the anniversary of Alfred Nobel's death. "The highlight of the Nobel Prize Award Ceremony in Stockholm is when each Nobel Laureate steps forward to receive the prize from the hands of His Majesty the King of Sweden. The Nobel Laureate receives three things: a diploma, a medal and a document confirming the prize amount" ("What the Nobel Laureates Receive"). Later the Nobel Banquet is held in Stockholm City Hall. A maximum of three laureates and two different works may be selected. The award can be given to a maximum of three recipients per year. It consists of a gold medal, a diploma, and a cash grant. 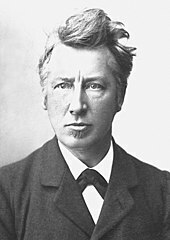 In 1901 Jacobus Henricus van 't Hoff (1852–1911) received the first Nobel Prize in Chemistry. The Nobel Laureates in chemistry are selected by a committee that consists of five members elected by the Royal Swedish Academy of Sciences. In its first stage, several thousand people are asked to nominate candidates. These names are scrutinized and discussed by experts until only the laureates remain. This slow and thorough process, is arguably what gives the prize its importance. Forms, which amount to a personal and exclusive invitation, are sent to about three thousand selected individuals to invite them to submit nominations. The names of the nominees are never publicly announced, and neither are they told that they have been considered for the Prize. Nomination records are sealed for fifty years. In practice, some nominees do become known. It is also common for publicists to make such a claim – founded or not. The nominations are screened by committee, and a list is produced of approximately two hundred preliminary candidates. This list is forwarded to selected experts in the field. They remove all but approximately fifteen names. The committee submits a report with recommendations to the appropriate institution. While posthumous nominations are not permitted, awards can occur if the individual died in the months between the nomination and the decision of the prize committee. The award in chemistry requires the significance of achievements being recognized is "tested by time." In practice it means that the lag between the discovery and the award is typically on the order of 20 years and can be much longer. As a downside of this approach, not all scientists live long enough for their work to be recognized. Some important scientific discoveries are never considered for a Prize, as the discoverers may have died by the time the impact of their work is realized. For example, the contributions of Rosalind Franklin in discovering the structure of DNA: her x-ray crystallography citing the shape of DNA as a helix, were not realized until after her death, and the recipients of the prize were Watson, Crick, and Wilkins. A Chemistry Nobel Prize laureate earns a gold medal, a diploma bearing a citation, and a sum of money. The Nobel Prize medals, minted by Myntverket in Sweden and the Mint of Norway since 1902, are registered trademarks of the Nobel Foundation. Each medal feature an image of Alfred Nobel in left profile on the obverse (front side of the medal). The Nobel Prize medals for Physics, Chemistry, Physiology or Medicine, and Literature have identical obverses, showing the image of Alfred Nobel and the years of his birth and death (1833–1896). Nobel's portrait also appears on the obverse of the Nobel Peace Prize medal and the Medal for the Prize in Economics, but with a slightly different design. The image on the reverse of a medal varies according to the institution awarding the prize. The reverse sides of the Nobel Prize medals for Chemistry and Physics share the same design. For a more comprehensive list, see List of Nobel laureates in Chemistry. In recent years, the Nobel Prize in Chemistry has drawn criticism from chemists who feel that the prize is more frequently awarded to non-chemists than to chemists. In the 30 years leading up to 2012, the Nobel Prize in Chemistry was awarded ten times for work classified as biochemistry or molecular biology, and once to a materials scientist. In the ten years leading up to 2012, only four prizes were for work that is strictly in chemistry. Commenting on the scope of the award, The Economist explained that the Royal Swedish Academy of Sciences is bound by Nobel's bequest, which specifies awards only in physics, chemistry, literature, medicine, and peace. Biology was in its infancy in Nobel's day, suggesting why no award was established. The Economist argued there is no Nobel Prize for mathematics either, another major discipline, and added that Nobel's stipulation of no more than three winners is not readily applicable to modern physics, where progress is typically made through huge collaborations rather than by individual scientists. "All Nobel Laureates in Chemistry". Nobelprize.org. Retrieved 2008-10-06. "Nobel Prize winners by category (chemistry)". Encyclopædia Britannica. Retrieved 2008-10-06. ^ "Facts on the Nobel Prize in Chemistry". nobelprize.org. Retrieved 8 March 2017. ^ "History – Historic Figures: Alfred Nobel (1833–1896)". BBC. Retrieved 2010-01-15. ^ "Guide to Nobel Prize". Britannica. Retrieved 2013-06-10. ^ von Euler, U.S. (6 June 1981). "The Nobel Foundation and its Role for Modern Day Science". Die Naturwissenschaften. Springer-Verlag. Archived from the original (PDF) on 14 July 2011. Retrieved 21 January 2010. ^ "The Will of Alfred Nobel", nobelprize.org. Retrieved 6 November 2007. ^ "The Nobel Foundation – History". Nobelprize.org. Archived from the original on January 9, 2010. Retrieved 2010-01-15. ^ "Nobel Prize History —". Infoplease. 1999-10-13. Retrieved 2010-01-15. ^ "Nobel Foundation (Scandinavian organisation)". Britannica. Retrieved 2013-06-10. ^ AFP, "Alfred Nobel's last will and testament" Archived October 9, 2009, at the Wayback Machine, The Local(5 October 2009): accessed 20 January 2010. After Nobel's death, the Nobel Foundation was set up to carry out the provisions of his will and to administer his funds. In his will, he had stipulated that four different institutions—three Swedish and one Norwegian—should award the prizes. From Stockholm, the Royal Swedish Academy of Sciences confers the prizes for physics, chemistry, and economics, the Karolinska Institute confers the prize for physiology or medicine, and the Swedish Academy confers the prize for literature. 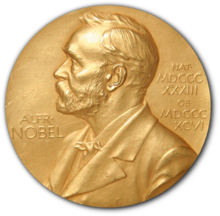 The Norwegian Nobel Committee based in Oslo confers the prize for peace. The Nobel Foundation is the legal owner and functional administrator of the funds and serves as the joint administrative body of the prize-awarding institutions, but it is not concerned with the prize deliberations or decisions, which rest exclusively with the four institutions. ^ Tom Rivers (2009-12-10). "2009 Nobel Laureates Receive Their Honors | Europe| English". .voanews.com. Retrieved 2010-01-15. ^ "The Nobel Prize for Peace" Archived 2009-09-16 at the Wayback Machine, "Linus Pauling: Awards, Honors, and Medals", Linus Pauling and The Nature of the Chemical Bond: A Documentary History, the Valley Library, Oregon State University. Retrieved 7 December 2007. ^ "The Nobel Medals". Ceptualinstitute.com. Archived from the original on 2007-12-19. Retrieved 2010-01-15. ^ "Nobel Prize for Chemistry. Front and back images of the medal. 1954", "Source: Photo by Eric Arnold. Ava Helen and Linus Pauling Papers. Honors and Awards, 1954h2.1", "All Documents and Media: Pictures and Illustrations", Linus Pauling and The Nature of the Chemical Bond: A Documentary History, the Valley Library, Oregon State University. Retrieved 7 December 2007. ^ "The Nobel Diplomas". Nobelprize.org. Retrieved 2014-08-24. ^ David Landes. "Americans claim Nobel economics prize – The Local". Thelocal.se. Retrieved 2010-01-15. ^ a b Hoffmann, Roald (9 Feb 2012). "What, Another Nobel Prize in Chemistry to a Nonchemist?". Angewandte Chemie International Edition. 51 (8): 1734–1735. doi:10.1002/anie.201108514. PMID 22323188. ^ "The Economist explains: Why is the Nobel prize in chemistry given for things that are not chemistry?". 7 Oct 2015. Retrieved 13 Oct 2015. The Nobel Prize in Chemistry at the Nobel Foundation. The Nobel Prize Medal for Physics and Chemistry at the Nobel Foundation. "Nobel Prize for Chemistry. Front and back images of the medal. 1954". "Source: Photo by Eric Arnold. Ava Helen and Linus Pauling Papers. Honors and Awards, 1954h2.1." "All Documents and Media: Pictures and Illustrations", Linus Pauling and The Nature of the Chemical Bond: A Documentary History, the Valley Library, Oregon State University. Accessed December 7, 2007.